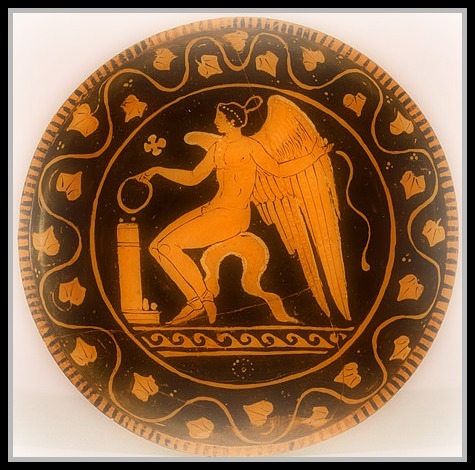 “Red-Figure Plate with Eros” by Ascoli Satriano (Dated 340-320 BC). Walters Art Museum, Baltimore. Eros was the Greek God of Love. His roman equivalent was Cupid. In Hesiod’ s “Theogony” he is represented as a cosmic force which emerged self-born at the beginning of time to spur procreation. Hesiod was making reference to the Protogenos (primordial deity) of procreation who emerged self-formed at the beginning of time. He was the driving force behind the generation of new life in the early cosmos. According to Hesiod, Eros was the fourth god to come into existence, coming after Chaos, Gaia and Tartarus (the Abyss or the Underworld). The Orphic and Eleusinian Mysteries featured Eros as an original God, but not quite primordial, since he was one of the sons of Nyx. The Orphics knew him as Phanes, a primal being hatched from the World Egg at creation. Hesiod also describes two love-gods, Eros and Himeros (Desire), accompanying Aphrodite at her birth from the sea-foam. This second and later sense is related to Younger Eros, a boy-god armed with bow and arrows. A minion who, according to Ovid, was son of Aphrodite, the Greek Goddess of Beauty and Ares, the Greek God of War, whose love affair represented an allegory of Love and War. Anteros was also the son of Ares and Aphrodite and therefore Eros’ brother. “Venus and Cupid” by Lambert Sustris (1560). 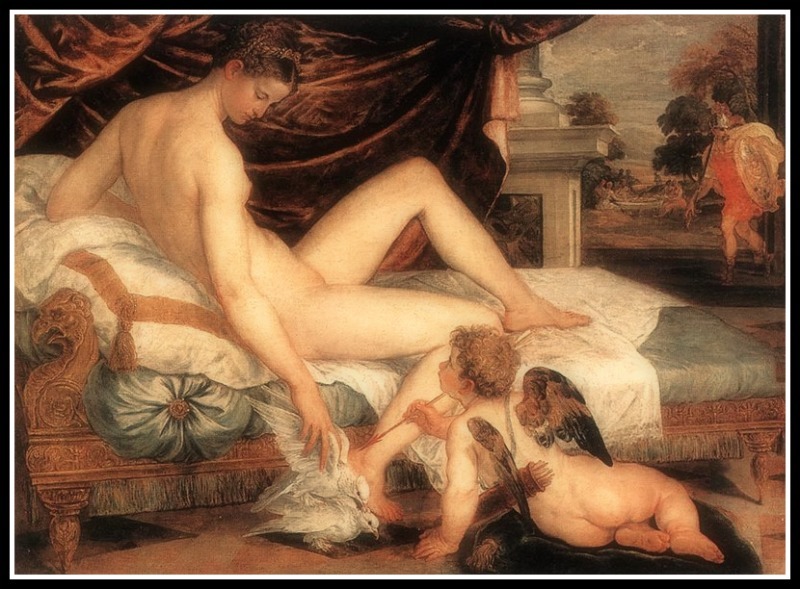 In this painting, Venus (Aphrodite) is stroking some doves (her attributes) in the presence of her son Cupid (Eros) as she awaits his lover Mars (or Ares in the background, right) who is on his way to join her. 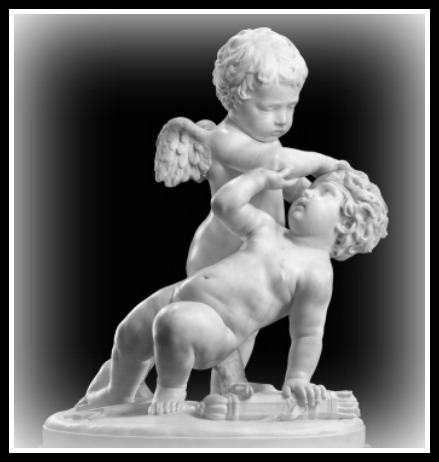 “Eros et Anteros” (ou “Deux Amours qui se battent”) by Alessandro Algardi. 17th century. 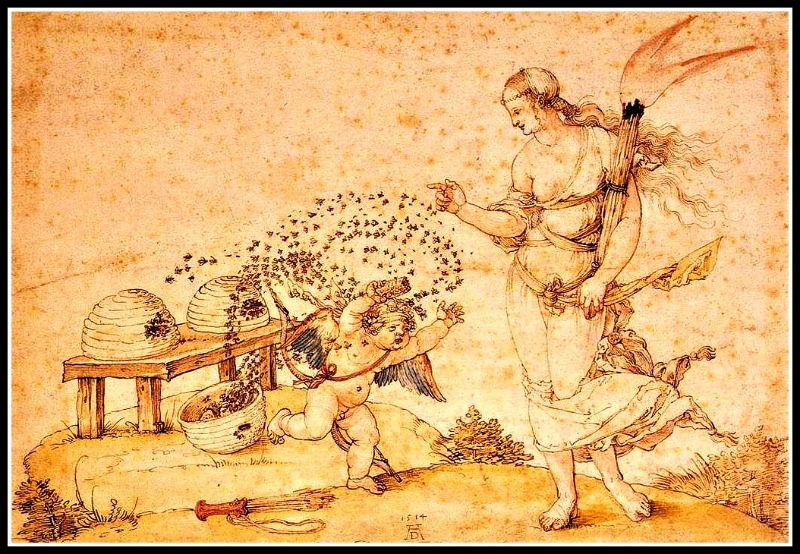 •Eros (Or Cupid), The Honey Thief: In “Idylls” of Theocritus (3rd century BC), the poet tells the tale of Cupid the honey thief, the child-god is stung by bees when he steals honey from their hive. He cries and runs to his mother, who laughs, and tells him that he also delivers the sting of love. •Eros and the Dolphin: In later art, Eros is often shown riding a dolphin. This may be a symbol representing how swiftly love moves. •Eros, the Blinfolded Minion: In the later satirical poets, he is represented as a blindfolded child, and this is a symbol of Love being blinkered and arbitrary. •Eros, the winged boy: He is also described a winged boy. This may suggest that lovers are flighty and likely to change their minds. He is just a boy, because love is irrational. •Eros’ symbols: The Arrow and the Torch: His symbols are the arrow and torch, because love is said to wound and inflame the heart”. According to Ovid, Cupid carries two kinds of arrows, one with a sharp golden point, and the other with a blunt tip of lead. “Cupid, the Honey Thief” by Albrecht Dürer (1514). “Cupid (Eros) complaining to Venus (Aphrodite)” by Lucas Cranach the Elder (1525). 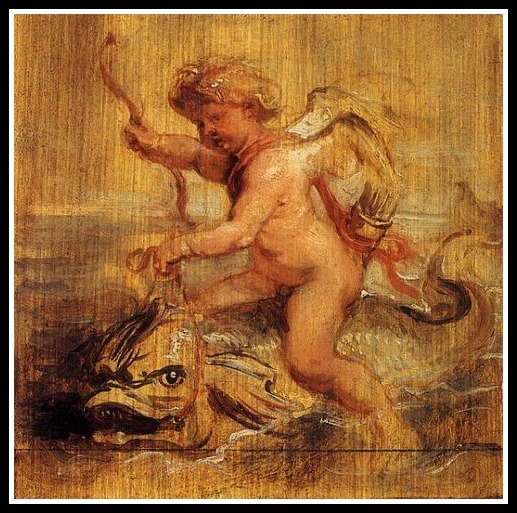 “Cupid riding a Dolphin” by Peter Paul Rubens (1636). 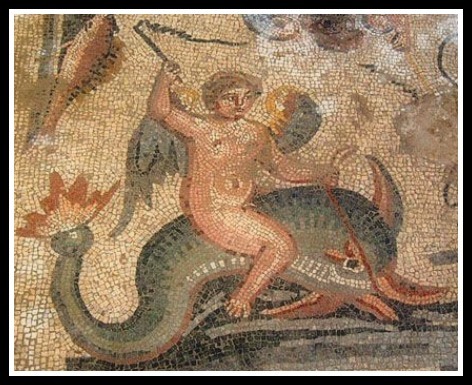 Mosaic: “Eros riding a dolphin”. Imperial Roman. (1st- 2nd Century). Eros rides across the sea on the back of a dolphin. He holds a whip in one hand, and a pair of reins in the other. 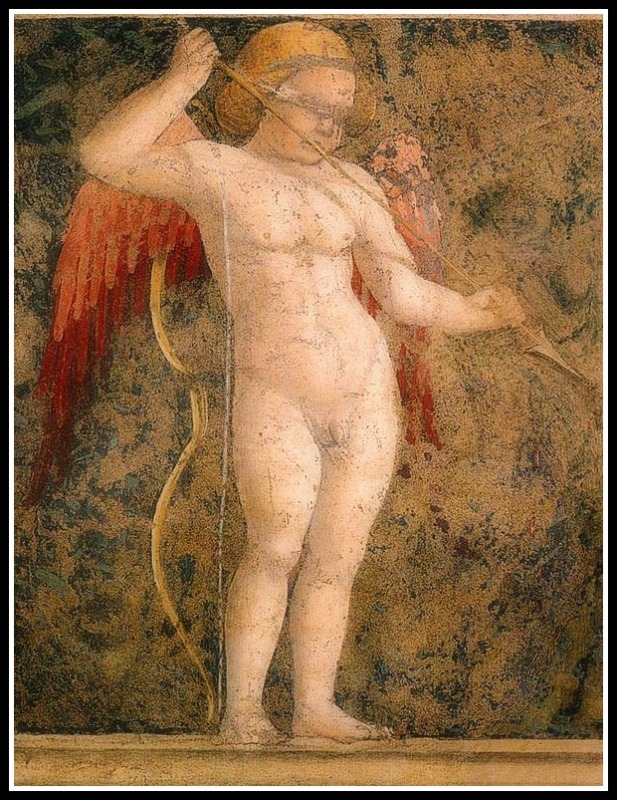 “Blindfolded, armed Cupid” by Piero della Francesca (1452/66). So fascinating and thorough! Thank you! Thanks a lot, dear Cindy. Interesting and informative, I didn’t know much about Anteros. Thanks for sharing. Besos. Thanks dear Stefy… I first knew about Anteros as I did the research for this post!. Quite unbelievable, right? Your blog just brings back so many memories. I got tortured with Latin and Old Greek in school and have forgotten a lot -so it seems. You refresh my memory about Greek mythology… Thank you for that! Thanks a lot LadyBug. I am happy to know that this post brought knowledges and memories back to you. And thanks again for the award nomination!. Another well researched and splendidly illustrated post, thank you. Thanks for dropping by dear Susan… Great to know that you enjoyed the reading. I love that. Does Greek mythology deal with the creation of the universe? It seems it does… If you have read “Theogony” by Hesiod you’ll find a good number of myths involved with cosmogony and creation of the Universe. Champion! I really should know this stuff. Thank you, my friend! I will send you the relevant excerpts on this subject (Gonna attach them at your blog soon, okay?). Double Champion is more than I could have ever expected TEHE 🙂 I’ll be there soon!!!. No rush, I’m popping out now. Thanks for sharing your clever insights. It is always a pleasure to visit you there!. Apparently this post has been dedicated to “Love”. Each of the reactions to love are the alter egos of Eros and Anteros. Not surprisingly anything to do with love is complicated and complex. As we all know. Nice work again my dear Aquileana! 🙂 Hugs for you! Thanks for highlighting the intertwined relationship between Anteros and Eros. I think this is the most symbolic aspect of the myth!. I liked so much your post about Eros. This mythology is as important today as it was back then. Today, we are all lovers of eroticism. I have written a poem in Spanish about Eros, but the verses do not have a defined metric, I know that you will like this poem. You can read it here. I am heading off to your blog to check out your poem. Thank you for adding the link here!. thank you so much Aquileana. Have a good night. I have just read your poem and left you a comment there. Nice one!… I liked it very much. Thank you very much for letting me know about it, YJ. Thank you very much, I have also loved your post. You have become a necessary handbook of Greek culture. I see a new post and I am smiling 🙂 I always look forward to them, as you well know! It is nice to learn more about Eros and his young, love-filled ways! Perhaps he has seen us under an apple tree lately? He may be smiling along with me too! In seriousness, your post is well done, including quality illustrations and useful links. Thank you for such a thorough overview of Eros! "In seriousness" (Wink), thank you very much for dropping by and for your words here. I love your posts and the pictures. I’ve been wondering though, is it my imagination or are only the grown men allowed to wear clothing? And… No, it is not just your imagination. Very well pointed out!. So very interesting with such a lot research as ever. I did not know that Cupid had 2 bows. Neat! There’s other things I didn’t know before. I did know some, but know I know more. Hi Resa… I know, I didn’t know that he had two bows. Neither that Anteros was his brother!. Great to have you here to share new lessons on Greek Mythology. You included the Rubens ‘Cupid riding a Dolphin’ and the Roman mosaic on the same subject – they’ve always appealed to me. Once more, expert and highly entertaining, you never disappoint. Hi John… Your words and encouragement means a lot to me as I love your poetry. I am glad that you enjoyed the reading… And I also found that the Dolphin, as one of Eros’ main attributes is an eloquent and amazing symbol. Wow, I had no idea that Eros was considered such an old god in the Greek pantheon. And Anteros is completely new to me. Seems like Eros was always causing trouble with his arrows. I didn’t know about the ones with the lead tips. I imagine it would be a curse to be struck by either one! Another informative and very enjoyable post, Aquileana! Indeed, Eros caused too much trouble with his arrows (well after all he was Aphrodite’ son, so don’t wonder why!). And regarding Eros and his “brother” I would like to point out something. The relationship between Eros and Anteros is well explained by Plato in his dialogue Phaedrus, where he stated: “They (the loved one and the lover) experience pain when the two are apart, and relief when they are together, the mirror image of the lover’s feelings, is anteros, or “counter-love”. Thank you very much for taking time to read in depth and comment consequently. My pleasure… I am heading off soon to your blog to check out your updates!. Very cool 🙂 Lots of great info here to supplement the Hallmark version that gets touted all over in the States every Valentine’s Day. This brings back memories of all the crafts I had to make in elementary school. I’m sure my mom still has those hearts and Cupids stored in a drawer somewhere. I remember a TV show from a number of years back that was supposed to be about Cupid in the modern age, but it didn’t make it a full season. I’ll see you in a couple of weeks when I get back from my trip! I smiled as I read through your words, dear Jeri… Well, being fair enough, you are absolutely right. Cupid’s updated version respects at least the main attributes if we keep in mind the ancient greek model (Cupid was in fact the roman equivalent to Eros). So well then, I hope you have a great trip. I’ll miss you. Thank you Aqui for all of your great posts..The Eros/Cupid parallel is the most well known..but for me the Eros and Anteros is more interesting…looking at society today, there are countless relationships where one half feels as though it is not receiving the equal expression of love in return that he/she is giving. Thanks for you clever insights dear Syl… I found that Eros and Anteros are a sort of dual force… And even when they are both related to Love, these brothers reminded me of Cain and Abel. Syl, You made my night with your words. Thank you! You’re welcome, sis and that is for always! on 09/12/2014 at 12:27 am | Reply F.G.M. I would be a bad play on word to say that this post is …”erotical”, Eros is such a unique figure in mythology; and an important symbol in psychology. 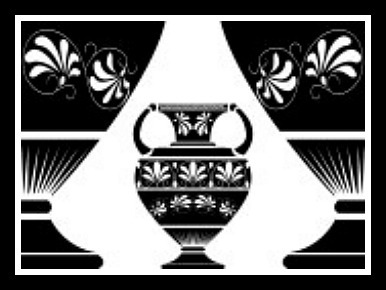 You have a very unique sense of synthesis, each of your new post is an “event” in it self… thank you Aquileana, as I often say to my readers, the world needs Poetry – but when I read your post, I think it also need Culture and History. It is always a pleasure to have you here and your words mean so much to me… You can’t even imagine it!. Aquileana, another lovely and informative post, of course including beautiful artwork! I especially like the information contained in the, “Eros, Greek God of Love: Attributes and Themes”. It gives interesting information about Eros, especially as we see him depicted in different forms of art. I think this allows for us to have a better understand of the narrative created by the artist, and how the artist intended for us to view the element of love. Thank you, wonderful as always! I am really glad to know that you enjoyed this post. I also find that the section called “Attributes and themes” is eloquent as it gives us a thorough description of Eros’ symbols and main characteristics. Most of his attributes were unknown so I learnt as I wrote the post and I am happy to share it with you!. Aquileana, thank you for sharing such detailed information about the symbols and characteristics of Eros. It’s so fascinating to me, great research, I’m very impressed! Take good care and have fun over the weekend! Thank you very much, dear Pepper… And same to you…Please keep it up with your mesmerizing poems… I truly enjoyed reading them today. It is always a pleasure to have you here. Ein schönes Wochenende fur dich! enjoyed the history tidbits and pics. Thank you very much for dropping by!.. I appreciate it. You really outdid yourself on the Eros research, here, Aquileana — a wonderful piece of writing. Thanks a bunch for your comment and support my friend. I am pleased to know that you liked the post … I hope you have a great weekend !. Have a groovy weekend, my friend !!!!!!!!!!! Great post, Aquileana. I would add Eros as a symbol for the ecstatic experience of a mystical union with the Divine (see Bernini’s “Ecstasy of St Teresa). Cheers! Outstanding and charming post! Great artwork. And who wouldn’t be charmed by a chubby winged little boy? But beware, his love arrow can sting. I didn’t know the story with the bees. Now I also know that he is represented as a little boy because love is irrational. My idea of Eros was very simple, just a boy with a bow and arrow, and I have seen him riding a dolphin but I didn’t understand the symbolism. The many representations of Eros reminded me of the song “Love is a many splendored thing”, although the song talks only about charmed love. And I’ve never heard of Anteros before. But his existence makes a lot of sense: lovers do fight. Thanks for putting it all together, Aquileana. It hadn’t heard of Anteros before I wrote this post either… You are right when you said that Lovers like to fight… And I am pretty sure that this two brothers also represent the ups of downs linked to Love. Thank you very much for dropping by!. Wishing you a great weekend ahead. 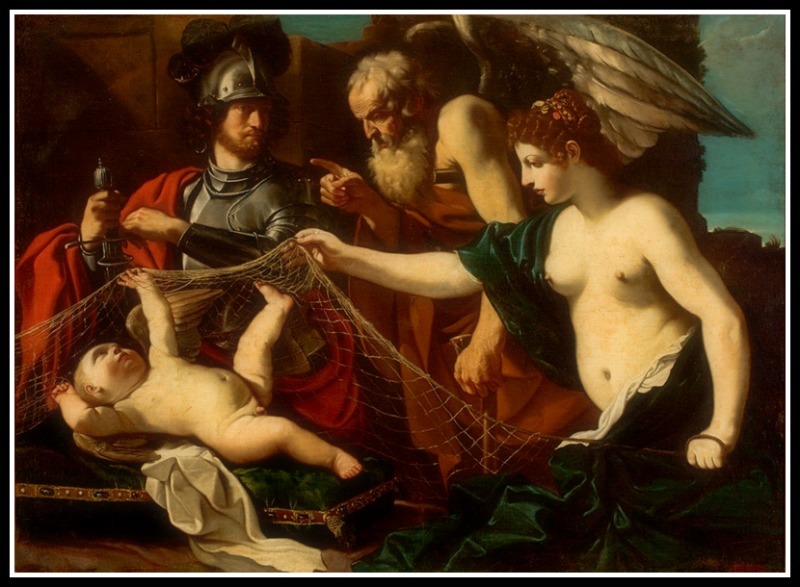 Greek Mythology: "Eros, God of Love and Son of Goddess Aphrodite".- http://t.co/WcfNd38L82 via @aquileana Charming post! on 09/12/2014 at 11:37 am | Reply Maria F.
When he is related to Psyche he is portrayed as a young male. Otherwise it would be hard to explain that he had sexual relationships with her, right? Cupid and Psyche (1817) by Jacques-Louis David. on 09/12/2014 at 10:49 pm Maria F.
on 09/18/2014 at 4:55 pm Maria F.
And as you very well point out, with this next post, the putto is gone, but only regarding his relationship with Psyche. Apparently with Aphrodite, however, he does remain a “putto”, I suppose to permeate his mischievous nature? What do you think? En concordancia con la época de estudiantes, amor y primavera llega este oportuno post. Gracias a él me “desayuno” acerca de la “existencia” de estos dioses autogenerados (por un instante me acordé de la generación espontánea) en contraposición con aquellos que nacen de otros. ¡Hasta entre ellos encontramos jerarquías! Otro detalle, no menor, es el de las flechas de oro y plomo. Intuyo que la de plomo, por las reacciones que provocaba, encuentra su correlación en el odio. Así, como las máscaras del teatro, amor y odio parece una pareja indisoluble. Lo cual me lleva a relacionarlo con Anteros (su hermano, por llamarlo de alguna manera si bien las interpretaciones pueden diferir). Los opuestos se atraen… Eso dicen, tal vez por eso los contrarios necesariamente se complementan. Eros and Himeros, I am glad to read that story Aquileana. Fantastic. Thank you very much for your kindness. Now I know about Aphrodite – The God of Love 🙂 Wish you have a great weekend, have fun! It boggles the mind — the many variations on one theme. Your posts keep my intellect humble, Amalia. My Eros? The modern winged one thinks Venus looks too…mature? Where are all the paintings of her as a young nicely-curved young lady? I am happy to know that you enjoyed the post and much appreciate your visit and comment. Another excellent post my dear Aquileana. Your ability to tie mythology into artistic endeavour speaks to the heart and soul of humanity. I look forward to every one of your posts. The comments add so much to the dialogue – I come back more than once!!! Sunshine in Vancouver throughout the weekend. Ready for a new week of adventures…. Great to know… we are close to spring here in Buenos Aires, Argentina (It starts on September 21st). Thanks for dropping by… I ‘ll make sure to check out your updates soon!. Merci beaucoup pour tes belles paroles… Tu es vraiment un poète. Je te souhaite bonne chance et J’espère que tu aies une belle fin de semaine. Todo un ameno y documentado repaso en tu entrada. Los mitos griegos son admirable sustancias de creación humana. Veo -y ahí tu aportación sabia en la materia- cómo Hesíodo apunta unos toques fastuosos de modernidad que apuntan hasta a lo precientífico porque anticipa y acuna razones primordiales. Muy interesante. Y una notita de nada: aquí en el litoral coruñés hay una ría: Ares; y un cabo, Ortegal, que tenía santuario -tiempos allá- dedicado a Afrodita y atendido por saterdotisas del amor. Y mira qué cosa tan amena y curiosa: allí de se alza un pueblo marinero que ostenta el muy bonito nombre de Cariño. ¿Habilitarían allá, nuestros personajes de buen y mal amor, un nidito de amor y fiesta? Creo que te gustará este excurso. Tus deseos hacia mi persona y tus palabras de aliento significan mucho, por lo cual quedo inmensamente agradecida. Great to read your comment this morning I hope all have been well with the moving, my friend. As a matter of fact I searched online information about his death and i didn’t find anything (yet). We’ll know more in further posts (new one is About Eros and Psyche, his beloved). There he appears as a young man (teenager!). Thanks a lot for your thoughtful words, dear Cindy… I much appreciate them. Bonsoir Aquileana, encore un bien beau billet sur la mythologie grecque. C’est magnifique et je suis heureuse d’aller et venir dans ton blog. Un grand merci. Je te souhaite un tout beau dimanche. Un post muy interesante. Quería decirte hola y que solo falto 2.5 meses antes de que me gradue. No sabía todo eso sobre Eros y Anteros – aprendo mucho aquí. Hola Cindy… Excelente saber de vos… En poco tiempo te vas a graduar en tu Curso y no puedo hacer otra cosa que felicitarte. “Perservera y triunfarás”, como decimos en castellano.Adelante siempre con tus proyectos e iniciativas. Hola querido Lamberto. Te agradezco tus palabras. Es un honor que hayas compartido el post en tu blog. Danke für den Kommentar und die besten Wünsche für Sie. Thank you very much Annette. I am pleased to know that you liked this post. Te he dado el Black Wolf Blogger Award, enhorabuena. Las normas, si te interesan los premios de blogueros, son sencillas. Dar las gracias a quien te lo dio y escoger otros blogs para darle tú el premio (creo que se suelen escoger 15). Si no te interesan este tipo de cosas perdona la molestia. Un saludo. Sigo el proceso en mi post del jueves… Justo estaba por agregar otros premios de manera que lo adjunto. I’m lucky to have been targeted by Cupid twice in my life. We wink at each other whenever I pass him in Piccadilly Circus but I haven’t been around there in years. I found the symbolism and allegories very interesting but wonder why a dolphin was used to represent speed when there were more obvious candidates. Delightful eye candy accompanies this piece as it does all your work – I imagine this must take considerable research and sourcing but it is appreciated. Thanks yet again Aquileana. I think that the dolphin might be probably related to the fact of being this animal considered a messenger of the Gods, the same was that Hermes (Mercury in Roman Mythology) was.. I found this explanation online but I am not sure of the specific symbolism. Muchas gracias querida amiga Rotze. This was so interesting and informative, Aquileana. You do such a wonderful job on your posts. Thank you very much for your support and thoughtful words. I appreciate them a lot. Amazing what the Greeks came up with. I’m not convinced these gods didn’t exist in some form. No matter the god, they are all unpredictable. You can follow all their rules and still run into trouble. Hi Jacqui!. Such a ready-witted comment. I nod in agreement with you… Not so sure if we should obey these Greek Gods / Goddesses’ rules!. Very well documented and interesing as usual ! Thanks Aquileana for this moment. Mythology is the cradle of the best histories I’ve ever heard. Aquileana Dear ! Just a flashing visit to say hi and tell you how glad I am that you keep posting glorious pages from the Greek Mythology.When I visit your blog I usually study it,I don’t read it and so I want to have more time to go through it meticulously and to really enjoy it.Tonight I’ll simply tweet it away and tomorrow I’ ll come back to write a proper comment. Thanks @DGMARYOGA for sharing this post at Twitter. Bonne nuit et je te souhaite un grand jeudi, mon ami. It has a quite sinister looking indeed… totally agree!. I have been rolling down and down and down … until,thank God, I found an empty space to put down my praises and my humble comment on your well-written and well composed work ! Eros,invincible in battle … , or simply stated = Even the pure Immortals cannot escape … No immortal God escapes from you,nor any man,who lives but for a day … In other words,nobody can fight you Eros ! Presumably,dear Aquileana,Eros is a super-power … and as Sappho says,an uncontrollable creature ! I also would like to mention that Eros,as Socrates says in the Cratylus dialogue,is introduced through the eyes,that’s the deep root of the Greek word Eros : έσρεί (=είσρέει) = a forceful power coming in through the eyes. (love against love ) has a very deep meaning as you can understand,and also (mutual love) or Himerus as you have written. And last,but not least,I gladly wander in your glorious Gallery ! What a fine selection of meaningful painting that efficiently intensify your brilliant work ! What a captivating and interesting comment! Dear Aquileana, you put so so much into each of your posts.. Now I had happened to have seen a painting before of Cupid being stung with the bees,but I didn’t know the story behind it.. Now I do..Of course I knew of the arrow and its meaning.. but the honey bees was a new one on me.. So thank you.. again I learn so much.. The paintings wow. loved them all including the mosaic .. When We used to travel abroad a lot some years ago, My Husband and I would always go to the museums within the various cities and love to look at art and the various different cultures on show.. I am certain it was in such a place maybe in Italy I saw a picture of Cupid, I can not be certain.. but We saw so many and paintings on ceilings in magnificent churches and cathedrals too..
Cupid with a Dolphin is a very ancient representation… If you have visited Pompeii maybe you saw those ones… And regarding the honey bee thief, it was the first time I read about that story too!. Great article, very well documented. Congratulations! Have a wonderful weekend, Aquileana! I really enjoyed this post, especially the amazing art. My favorites included the honeybees and the mosaic, to which I am partial anyway. Eros is prominent in my astrology chart so I was drawn to learn more about his nature. Thanks a lot for dropping by and for your thoughtful comment here!. Thanks @cindymars for sharing this post at Twitter. I always considered Eros a cheeky imp and causing mischief especially when bringing two lovers together. It always interesting to read about the various myths Eros is in and the various antics he and Aphrodite got into. I do enjoy reading your posts, most informative and interesting! Thank you very much for your thoughtful comment dear Luciana… I also considered him in a quite similar way… And you are right regarding him and Aphrodite. I guess they were both together involved in complex issues and intertwined stories. Hola Aquileana, acabo de nominarte para otro premio, ahora es el Black Wolf Blogger Award, aunque ya te los debes saber de memoria, puedes ver los datos en https://2012profeciasmayasfindelmundo.wordpress.com/2014/09/23/dia-mundial-de-los-animales-4-de-octubre/ ¡felicidades! Thanks a bunch, dear Lignum… Wishing you all the very best!. Thanks @Supernova1c for sharing this post at Twitter.